Window envelopes come in many shapes, sizes and colors. They are primarily used for personal and business correspondence. A windowed envelope allows a pre-printed address to show through the clear window patch eliminating the need for additional addressing on the envelope. Double window envelopes allow the address to show through the bottom patch and the return address to show through the top window patch. 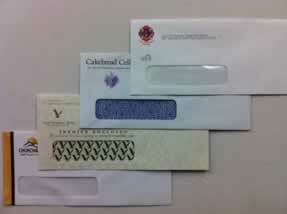 A window envelope can have a single window, double window or a full view window patch. There are standard size window envelopes as well as custom window envelopes. On a commercial size envelope the standard window patch is 1 1/8” x 4 ½”, 7/8” from the left and ½” from the bottom. 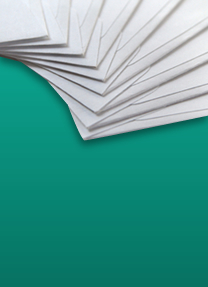 Commercial envelopes range in size from 6 ¼” to #10. In addition to the commercial sizes, window envelopes can come in various large size envelopes to allow for the materials inserted to remain flat. For sensitive information an inside tint can be added to the window envelope to ensure privacy. The inside tint is a pattern printed on the entire inside of the envelope to protect the information enclosed in the envelope. At First Impressions Printing we are a full service envelope manufacturer. We can create any envelope to fit your needs. A window patch can be placed almost anywhere on the envelope and can be any size. Security inside tints can be added as well as special closures such as latex or peel-n-seal can be added to the flap.